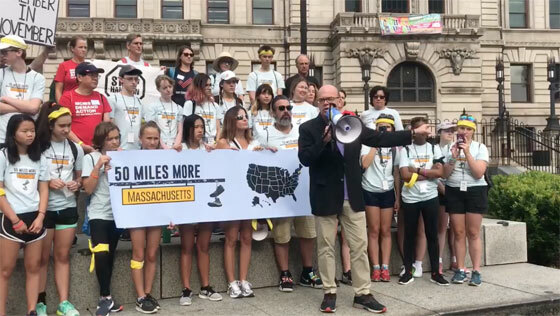 Last week, I joined young activists as they began the 50 Mile March from Worcester to Springfield to raise awareness of gun violence. These powerful voices — the voices of the future of our nation — are bravely stepping forward and calling lawmakers to action. I find myself both inspired and troubled by their efforts. I am troubled that our children can no longer feel safe at school. A looming threat of gun violence should never be part of any environment — let alone a learning environment. Yet, I am inspired and energized by their diligence in keeping this at the top of the agenda. I am calling on Congress to get serious about commonsense gun laws. It's past time to stop prioritizing special interests and gun lobbyists over the wellbeing of our families and communities. In November, I hope you'll do the same. But right now — learn about 50 Miles More! Share their stories. Start the difficult conversations. Save a life.